I use the product twice a day, morning and evening. I usually use the La Roche Posay Hydarphase serum with it. I also bring a small amount down onto my face and chest. I also developed small patches of very dry skin on my shoulders to which I applied a small amount of cream and saw a noticeable the condition improve. I also like the packaging NUTRITIC INTENSE comes in, I like the glass pot for moisturisers and makes the product feel more luxurious - it's also easy enough to travel with too not being too big or heavy. I haven't quite got used to the smell, but I don't notice it as much, it's a somewhat medical-type smell. The texture of it is lovely and rich without being greasy and spreads out really well. I found I saw instant results with NUTRITIC INTENSE. It spread out well and absorbed into my skin quickly leaving it soft, subtle and smooth. I found the effects of the cream lasted for a lot longer than some previous creams I used. My skin felt comfortably soft for the day regardless of whether I wore make up or not. Initially I had been sceptical that I could use an "intense" cream under my make up but NUTRITIC INTENSE absorbed into my skin quickly and did not leave any residue or greasiness which made make up application a dream. I felt the application and appearance of my foundation has improved since using the cream. The lasting effects of NUTRITIC INTENSE have impressed me greatly. Even if I miss using the cream once or twice my skin does not revert back to its previous dry state. I have found that stubborn dry patches and patches of dehydrated skin cleared up quickly and effectively and show no signs or recurring which often happened with previous creams. I would recommend NUTRITIC INTENSE to people who suffer particularly dry skin and dehydrated skin, especially in the winter - with all the cold weather recently it has really helped protect my skin and ward off any appearance of winter-skin. I will be interested in seeing how it performs during the summer months when my skin can tend to be a little more oily, I don't know if I will still continue using it twice daily or whether it will become a night-cream in the warmer months. I find my skin is ready for make up application in a matter of minutes after applying the cream. When applying it at night I find in the time it takes me to get from the bathroom into bed it feels as thought the cream is almost completely absorbed. My skin is generally quite flushed, especially if a product irritates it. I find my skin reacts very well to NUTRITIC INTENSE and as a result there is now extra redness to my skin. As my skin became more hydrated over the weeks the redness in irritated areas reduced. I used to suffer quite badly with flaking around my nose and on my cheeks which make make up application a bit more difficult but I haven't had the problem in recent weeks since using the cream. Since the dehydration in my skin cleared out I noticed my skin is slightly oily which leaves me with a few breakouts. Thankfully NUTRITIC INTENSE does not aggrivate this at all, if anything it helps with keeping dryness somewhat at bay when blemishes are clearing up, but I find I need to use a targeted blemish treatment as well to treat and clear them up. But I think in a few more weeks as my skin adjusts more, breakout will continue to become less frequent and so I think my skin will continue to get smoother. I strongly feel this is my favourite moisturiser, and will be a permanent fixture in my skincare regime for years to come. It seems to suit my skin perfectly, and I have been growing happier and happier with my skin since using it and look forward to using it in the future. Now I'm looking at things like all is not lost. If I have a problem, I can manage it and fix it. I feel like I really know what to do now. One note on the glass pot - I have very long nails. I'm not even joking, they grow very fast without my noticing it and before I know it I have chunks of moisturiser hiding under my nails. I grabbed a cheap metal nail tool, it's horrible and pink. I use the flat end, I imagine it's meant to be or pushing back your cuticles, to scoop out a small amount of moisturiser and put it on the back of my hand. You only need a tiny amount of this cream and this has helped me use it sparingly, as I should be. 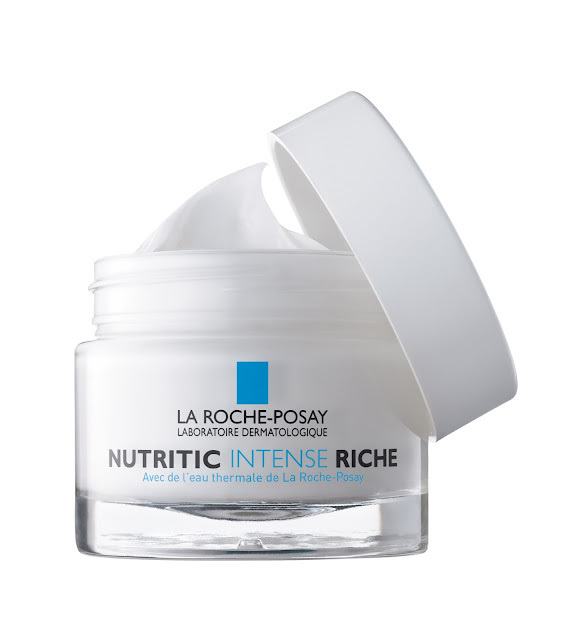 La Roche Posay Nutritic Intense Riche has just launched in Ireland. From what I saw online it looked like the launch itself was amazing. Admittedly, it's a very bold claim to be making ... but I stand by it. Have you had a mousturiser that saved your skin? Another one for the wishlist! Wow I was totally absorbed in your story! Well, I'm almost feeling sad about not having a dry skin because you've made me quite anxious to try this product. I'm happy you found something that actually works with hydrating your skin. Just starting to try this out and my boyfriend and I are both LOVING it!